If you don’t have a hankering to go see this museum after the first two posts about our trip (read Part 1 here and Part 2 here), I don’t know what to tell you. It took us two full days (and then some) to see this museum and we had a BLAST. 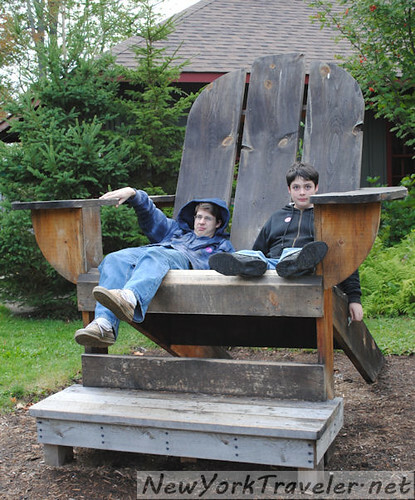 My kids’ heads are officially stuffed with Adirondack information. By the time we pulled out of the parking lot at closing time, we were ready to haul out a boatload of cash to buy our own little cabin in the woods! 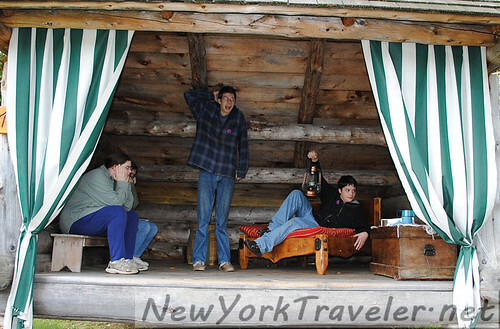 In the previous posts, I yakked on about the Adirondack hermits, Adirondack stuff and paraphernalia (aka, junk) that previous campers and residents left behind for us to ooo and aaa about, and I talked about the wonderful methods of transportation back in the ‘ol days (and you think modern potholes are bad, check out the old plank road!). 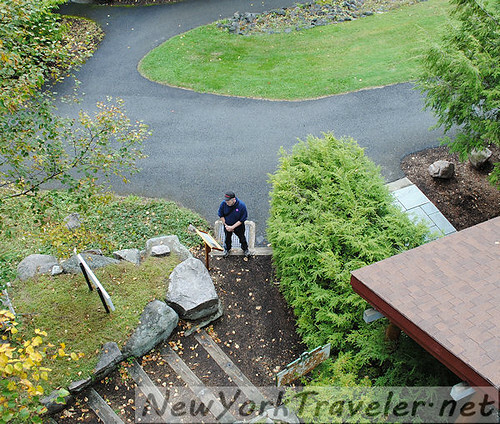 For this post, I’ll talk about the modern Adirondacks– the Winter Olympics and Smokey the Bear, woo hoo! 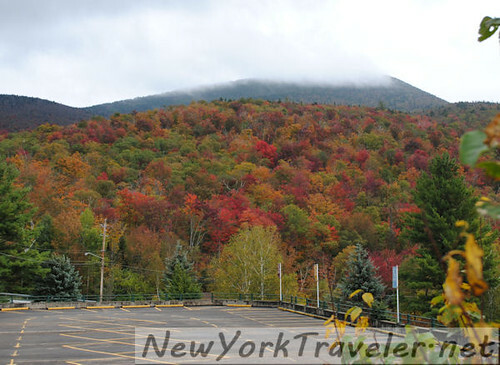 Twice, Lake Placid in the Adirondacks has hosted the Winter Olympics, in 1932 and 1980. I remember watching the 1980 games on TV and feeling that tremendous surge of pride as a New Yorker. 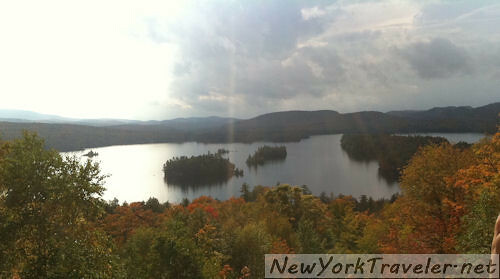 Lake Placid (where we hope to visit very soon) is a wonderful little community of sports enthusiasts. Dozens of winter athletes have come from this little town, including Jack Shea, winner of the 1932 gold for speed skating and his grandson Jimmy Shea for skeleton sledding in 2002 in Salt Lake City. 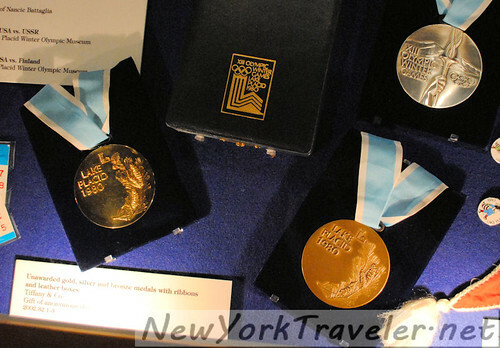 The museum has a small section devoted to Olympic history. 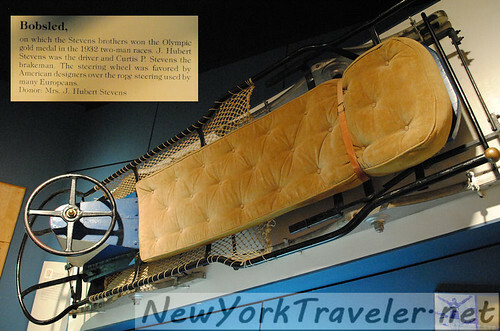 This is the sled on which Francis Paul Stevens won his silver medal in 1932. A little bit of trivia– did you know that the Lake Placid High School is the only school in the United States to have been issued an alcohol license? During the 1980 Olympics, the school served as a private bar. Lake Placid was also one of the first communities in the U.S. to build a golf course, in 1898. Moving along, we wandered through another very large building dedicated to the various industries in the Adirondacks. Logging was the biggest, and there was so much to see and learn. We all found it extremely fascinating, with many old tools, displays, plaques and stories of the loggers and their families. What a tough, tough job. I’m amazed at the strength of these guys. This is one of the many gigantic piece of equipment the loggers used. 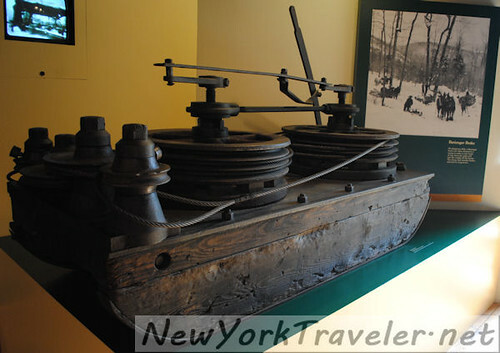 It’s a Barienger brake, a huge piece of machinery that controlled logs (and horses and men!) 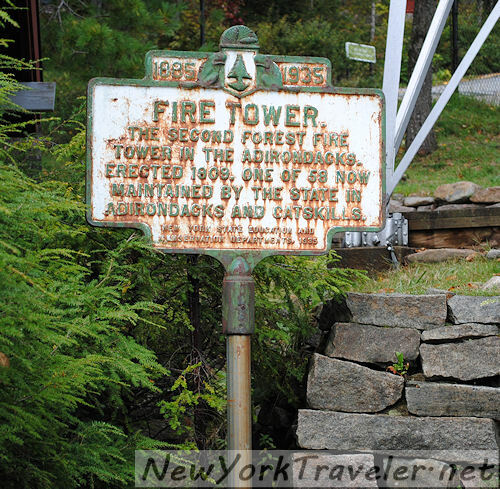 as they were transported down the steep slopes of the Adirondack mountains. 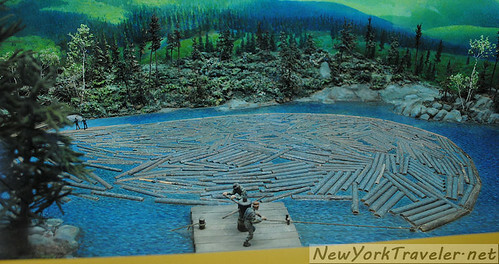 Men also transported logs by the many waterways of the ADKs. I loved this diorama. 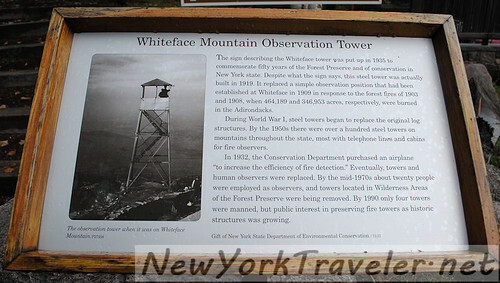 After spending over an hour in this one building, we ventured outside to the old Whiteface Mountain fire tower. The view is so cool. 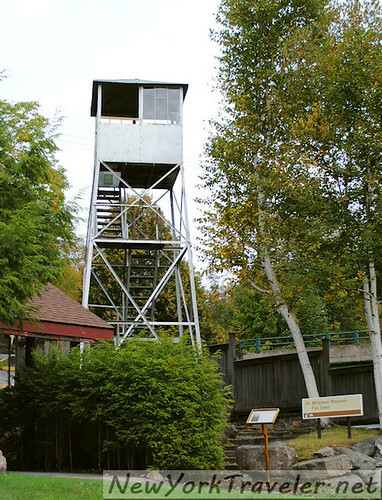 Obviously, these fire towers could make or break a community. To heighten awareness of the threats of fire to visitors, Smokey the Bear was invented by the United States Department of Agriculture in 1942. This is a genuine old Smokey suit. 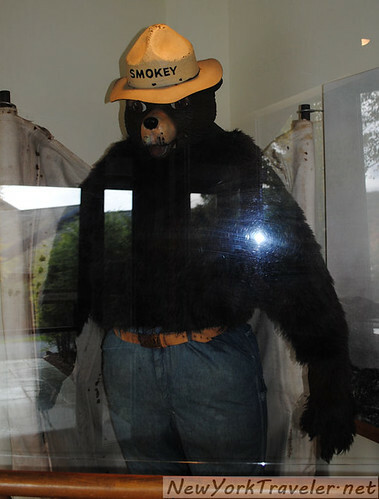 Did you know that Smokey was named for Smokey Joe Martin, a New York City assistant fire chief? The last moments of our visit were spent enjoying the various outbuildings. 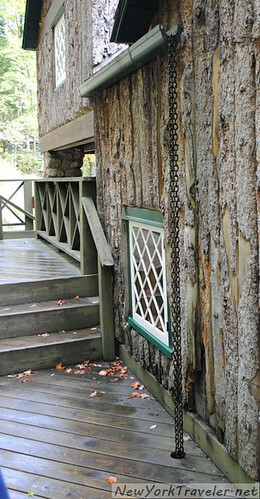 Many were reproductions of typical ADK cottages and summer camps, all sporting unique and quirky objects, like chain rain gutters, rustic playhouses and furniture made from twigs. Before the sun set and the museum closed, we scampered over to the back of the museum to take one final glimpse of Blue Mountain Lake. As dusk approached, a couple of loons trumpeted over the lake. It was absolutely beautiful. I miss it so much. Thanks for reading. 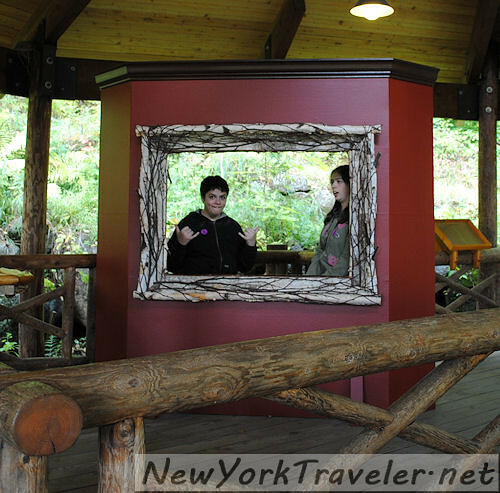 If you are ever in the Adirondack region, check out the museum. It’s a blast!